With the holidays upon us, are you curious to know the most appealing apple varieties to bake with or eager for a new recipe to try. 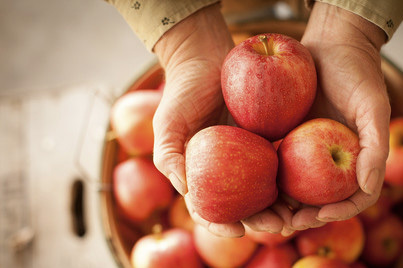 Here are some tips on baking with apples from Susan Brown, Herman M. Cohn Professor of Agriculture and Life Sciences and one of the world’s leading apple breeders in CAL Notes. When baking with apples, it is important to use more than just one variety if possible. It adds to the flavor and to the texture. If one variety bakes down too much or releases too much juice, the other often doesn’t and your dessert is better. If you missed the Plant Science Community Holiday Party last week — or just want to recapture the spirit of the day — Carol Grove has kindly posted pictures from the event. This ensemble was among the entertainers at the Plant Science Community Holiday Party. The Growth Chamber Phase One Energy Conservation Project saves Cornell University $19,000 and 580 tons of carbon annually. The chambers now provide energy efficient, properly controlled growing environments for plant research. The produce industry and the federal government have started to demand GAP certification – Good Agricultural Practices. In response, Cornell National GAPs Program and the Cornell Cooperative Extension of Yates County hosted a multi-day workshop to teach farmers about GAPs, how it works, and how to create a food safety plan for farms. Thomas Bjorkman led a Cornell team that developed a new broccoli plant ideal for the East Coast’s hot, steamy summers. The Eastern Broccoli Project, based at Cornell University Agricultural Experiment Station in Geneva, promises to bring sweet, crisp, local broccoli to Eastern farmers and consumers. More locally grown broccoli will also save diesel fuel, generating fewer greenhouse gases. The Cornell Cooperative Extension of Schuyler County organized Mushroom Field Day, featuring a morning workshop and afternoon walk. The workshop, led by Dr. Ken Mudge from Cornell University focused on shiitake mushroom cultivation, and the Wild Mushroom and Forest Health Walk was led by Dr. George Hudler from Cornell. The Day was sponsored by the NY Forest Owners Association – Southern Finger Lakes Chapter. Cornell University offered its first Permaculture Design Certification course in the Department of Horticulture. Cornell Cooperative Extension presented a two-day conference, “Organic and Sustainable Gardening in a Warmer Planet,” in which leading Cornell researchers offered informative sessions on practical tools for successful gardening in the face of extreme weather events and a warmer climate. Cornell Plantations started the Plantations Environmental Education Program forSustainability (PEEPS) geared toward students ages 14-18 who want to work in a “sustainable backyard” and take part in community outreach activities. 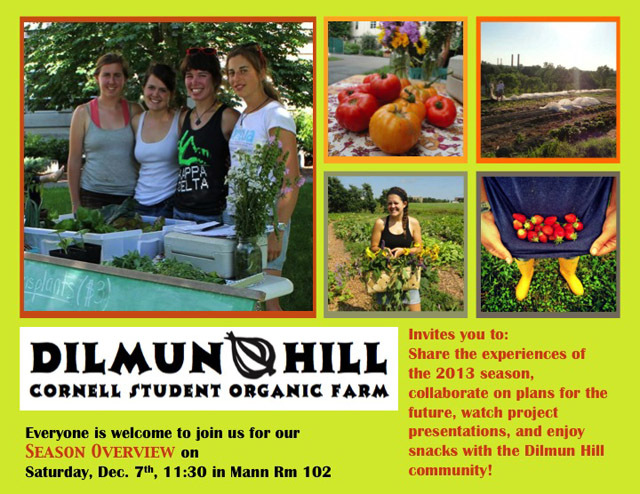 The Cornell University Horticulture Departmentis partcipating in the Food Dignityproject, which is studying the local foods movement and how communities are contributing to food security. Part of the project has measured how much produce was grown in Ithaca and Dryden communitygarden plots. The Ithaca Children’s Gardenoffered a hands-on workshop on how to create stickworks led by renowned sculptor Patrick Dougherty. Dougherty’s visit to Ithaca was made possible by the Cornell Messenger Lecture Series. Cornell University professor, Tom Whitlow, hosted a talk on the challenge of maintaining biodiversity in areas heavily impacted by human activity. Rain gardens, filter strips and bioswales are a great way to help reduce runoff, flooding and pollution while increasing groundwater infiltration and aquifer recharge – especially in urban areas. These stormwater prevention practices are often planted with herbaceous plants such as swamp milkweed, soft rush and Joe-Pye weed that tolerate periodic flooding while also surviving dry periods between storms. 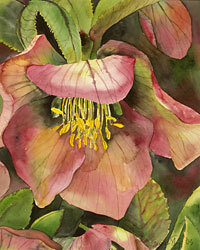 But these plant need to be cut back annually after their leaves and stems die back to the ground. Carefully chosen woody shrubs, on the other hand, can do the same job with less maintenance. Plus they can provide aesthetic benefits, year-round interest, shade and wildlife habitat all while removing and sequestering carbon dioxide – a greenhouse gas – from the atmosphere. 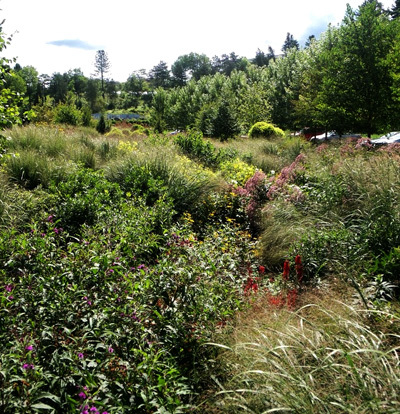 To help choose the right shrub for these uses, the Department of Horticulture’s Urban Horticulture Institute (UHI) has just released a 56-page guide, Woody Shrubs for Stormwater Retention Practices (Northeast and Mid-Atlantic Regions). The guide details site assessment and design considerations for those practices and profiles more than 35 woody shrub species that can tolerate both dry and periodically saturated soil conditions typical of retention areas. The guide is based in part on a study conducted in Ithaca, N.Y., by Master of Professional Studies student Ethan M. Dropkin guided by co-author and UHI director Nina Bassuk. The study tested the flood and drought tolerances of six of the shrub species included in the guide. 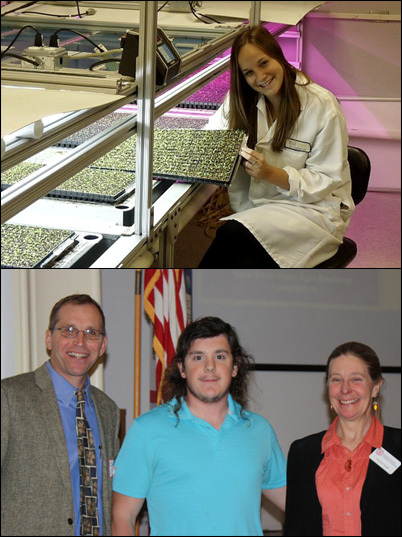 Every year the Seed Committee of the New York State Agri-business Association, together with the American Seed Trade Association, honors Cornell undergraduates in the plant sciences who have demonstrated academic excellence. Congratulations to this year’s awardees, Nicholas Biebel ’14 and Madeline Olberg ’14! Cited for their outstanding GPAs, research acumen, and enthusiasm for plant sciences, Biebel and Olberg were recognized during the 75th Annual Cornell Seed Conference held at the New York State Agricultural Experiment Station in Geneva on Dec. 5. Madeline Olberg ’14 (top) has pursued plant science research, both at Cornell and through an internship with Ball Horticultural Company. Nicholas Biebel ’14 received his award from John Uvege, Co-Chairman of the Seed Committee of the New York State Agri-business Association, and Margaret Smith, Associate Director of the Cornell University Agricultural Experiment Station. Concord grape growers in western New York this season expanded the use of mechanical crop thinning techniques pioneered by three generations of Cornell viticulturists to maximize the value of an abundant harvest in what started as an uncertain year. By removing up to one-third of their crops in late July and early August using mechanical grape harvesters, growers met maturity standards and avoided millions of dollars of crop losses. 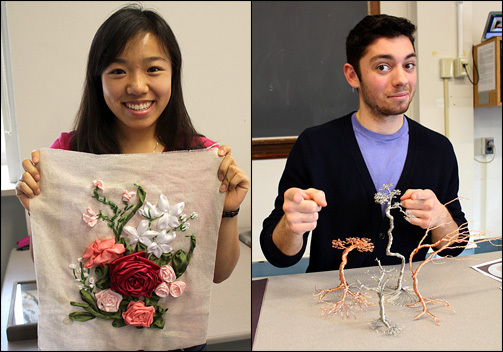 You can view works by students in previous classes on display in the cases in the west wing of the first floor of Plant Science Building. 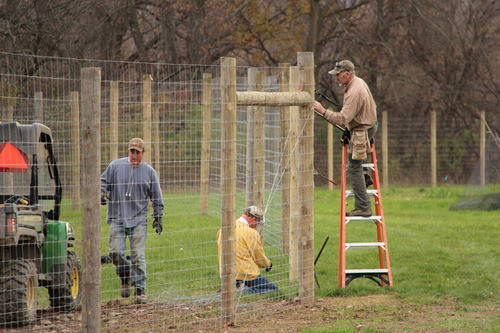 Staff install deer fence at Thompson Research Farm. Photo: Anja Timm. Staff at the Homer C. Thompson Vegetable Research Farm in Freeville, N.Y., recently installed one mile of eight-foot-tall woven wire fence to protect 30 acres of organic research projects — including tomato-, pepper- and cucurbit-breeding, trials on soil health and crop rotation and more — from deer damage. And they did it for 80% less than the cost of hiring an outside contractor. Heavy deer pressure threatens the accuracy of most small-plot agricultural research. Staff from many research programs install temporary electric fencing to protect research plots, a significant ongoing investment in time and materials. The Freevile farm is one of seven managed by the Cornell University Agricultural Experiment Station. CUAES staff plan to replicate this fencing model at other farms. Read full post by Anja Timm at CALS Notes.